We love it when listeners send in podcast topic suggestions; not only does it mean that there are actually people out there paying attention to what we have to say, it also means that we don’t have to wrack our brains thinking of something interesting to talk about! This podcast topic comes to us from long-time listener Neil Biggs. He asked us to dig really deep into the retail and Kickstarter sides of what makes certain games hold a high value both for gamers & publishers. 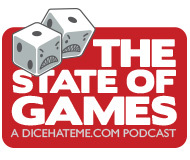 You’ll also get to hear about Darrell’s adventures at Essen Spiel, how TC designed a whole Euro about a boring city in 5 hours, and how I just had to create the dinosaur game mentioned on the last podcast. Rawr.